It is a rather annoying question in many ways, as there isn’t a key to teaching. If there was, then we would all manage to have outstanding lessons, with outstanding progress and outstanding behaviour every single lesson. In reality, there are so many factors affecting ever single minute of every single day that that is not impossible. I think the ability to not take things personally is something we all need. Pupils may have come in in a foul mood due to something that has happened at home. This can happen to all of us, but for teenagers this can be particularly tricky as they have hormones racing and often can become over whelmed with emotions that come out in all sorts of ways. The pupil that calls you a name, or shouts “I hate you” when you ask them to do something may in fact be releasing a valve of emotions aimed at something or someone else. It can sometimes be hard, but we need to not hold these outbursts against pupils, as if we do we will be creating tension in future lessons which can affect the quality of those lessons and lead to further confrontation. As teachers we put a lot of time and effort into our roles. Standing at the front of a class can be exhausting in itself, but the planning, marking, reflecting etc etc that we must do to be good at our jobs is vast. This is something people need to realise before they come into teaching. IT is a commitment they need to make and one they have to stick to. Planning and marking are equally as important as teaching, and if you aren’t prepared to work hard you won’t get anywhere. By this I don’t mean that all teachers have to put in 18 hours a day 7 days a week, this would be ridiculous and certainly would lead to a massive burnout both physically and mentally. Each person is different, and finding that “work-life balance” is essential. Different people work in different ways. I have colleagues who leave shortly after the bell and put a ton of work in at home, I know people that do a little each day but devote the majority of their Sunday to work and I know people who work solely at school. I know people who work in many different ways. At our school the Executive Principal hasn’t set hours where we must be onsite as many schools do. She trusts us as professionals to be able to manage our own workload and ensure it all gets done. This is an approach I welcome. On the whole, I do most of my work at school, staying most evenings until half five/six o’clock. I find I work better and smarter at school than I would at home and manage to do all I need to in that time. This gives me a few hours on an evening at home with my family and normally my weekends free. I worked out my weekly hours to be around 50 most weeks. I also pro-rata’d them over the course of the year, if I were in a job with normal holidays, and was interested to see that it was around 40, which is a normal working week in most professions. The things I think our most imperative to success are relationships, both with classes and with colleagues. With colleagues you get a support network, you have people who know what you’re going through, who can pick you up, and can give you advice when you need it. They are also a great source of ideas, resources and can be great help planning lessons. They are also the adults you will spend the most time around and as such a strong relationship and the ability to have a laugh is essential. Relationships with students are also important. You need your relationship with you class to be clear, and defined. It needs to be a good one. They don’t need to like you, but it can be a great help if they do. They do need to respect you (and your authority), otherwise you won’t get anywhere with them. I am lucky in that I have managed to forge great relationships with the majority of my classes, and I find that this means behaviour is not a big problem for me day to day, despite the fact I have some real tough classes. During my NQT year I really struggled at times. There were a couple of classes that I couldn’t handle at first and it became a real battle. My NQT mentor was the then ASP in our department, and as part of a project called Developing a Pedagogy of Practice (DPP) I was assigned the (then) senior vice principal as an SLT mentor. Both of these mentors (and the vice principal in charge of staff development) were highly instrumental in me turning it around and becoming a teacher who is “consistently good or better”. The support I got was fantastic all round (but that’s a topic for a different blog). The reason I mention this now, is that I wanted to recall something that my mentor said in a meeting. She had recently been judged outstanding and was reflecting that she didn’t know what made her so outstanding. I had seen her teach many times and I said that it was just the way she is with classes. That her lessons were obviously outstanding from the get go. She turned this around and said, “That’s what you need to do, you need to find the way that you are in the classroom. You need to let your personality shine through.” I thought about this, and looked at the classes I had already built good relationships with and realised that they were the classes I had let more of my personality out in. They were the classes I knew better, and who knew me better. I made a conscious effort to be like that with all my classes and it got better. Even with the year 9 class I had that were really challenging across the board. There lessons went from 4 hours of misery to three and a bit hours of Maths! (I won’t lie, the last lesson on a Friday when they were ready for the weekend tended to degenerate half an hour from the end, even when he rest of the week had got better). It seems strange to say now, as I struggled so much for most of that year with them, but I really miss teaching them. I had that relationship by the end, and I often end up chatting to them at break and lunch. Over the last three weeks this sentiment that is present in so many films has been showing itself in my classroom. Specifically during my year 13 further pure lessons. It has been a real joy to see the superb mathematicians my students have become, especially given the fact that their teaching prior to A level had left a bit to be desired. We have come a long way since they started year twelve with major gaps in their knowledge which we have had to fill in on the way. Recently we have been covering further complex numbers. When we came to de Moivre’s theorem I was planning the intro lesson and I decided that I would prove the theorem for them so they could see why it worked. However, when it came to teaching the lesson I changed my mind. I gave them a brief biog of de Moivre (not required course material I know, but I find it interesting and so do they), then I showed them the theorem he came up with. I then asked them to prove it by induction (they have already covered proof by induction). They managed rather quickly to apply their knowledge of induction and prove de Moivre’s theorem for all positive integers. I was astonished by the speed they managed this so instead of showing them how to prove it for all negative integers I asked them if they could work it out. Again, between them they blitzed it. It was a joy to watch, and it was brilliant to see the enthusiasm from all of them as they bounced ideas off each other and came to their answer. As an extra, I told them Euler came up with a much simpler proof using a different formula we had already proved (Obviously Euler’s formula, but I didn’t tell them that) and asked them to see if they could come up with that. Again, they blew me away with the speed they managed this. Again, while looking at loci in the complex plain I put up some examples on the board to go through, and they managed to guide me through them with minimal (if any) input from me. At one point one of the class asked “Why when you get rid of the modulus is it just, ‘x2 + y2 ’, where is the 2ixy, and why isn’t the y2 negative?” and before I could say anything one of the others gave an explanation that was phenomenally detailed but still crystal clear. The third instance of this though, and probably the strangest, was when we were going through the C3 and C4 papers they had sat (none of them got what we were expecting so we wanted to know what went wrong). One of the lads was spotting his own mistakes and correcting them far, far quicker than I could manage. He had corrected them all to perfect answers (dropping only a couple of marks) within an hour. This was both quite brilliant, and quite infuriating, as he clearly knew his stuff and should have had at the very least 90%! Perhaps I’m naïve, but the coincidental timing of the deluge of people from my PGCE course who left the month after the “golden hello” arrived in our bank accounts was staggering, and I think it is people like this who skew the figures. When I was training, and since for that matter, I have encountered many maths teachers/trainees who didn’t seem to have an appreciation for the subject. This struck me as strange initially, but then I realised why. There was one lady on my PGCE course who baulked at the thought of algebra, her degree was in MFL (I think) and she made no bones about the fact she didn’t like maths. She had been made redundant from her previous job which involved bookkeeping and she had been short of ideas, so had decided to take the bursary and get paid to train as a teacher. She didn’t make it through the course. However, there were others who did, but equally didn’t seem to like maths or who had an obvious preference to other subjects, but had chosen maths as the bursary/golden hellos were bigger. I think the negative impression of teachers given in the press and held widely by society are also at work here. As people think that teaching is a 9-3 job (it isn’t) with masses of holidays (there is). I think people then come into teaching with the idea that they will just have loads of free time, they don’t realise that you need to put the work in outside of lesson hours. And they then realise that, actually, it is a lot of hard work and in many cases this makes them rethink and leave. My own journey into teaching was a rather long one, but one which had a lot of thought put into it. I had first decided I fancied teaching as a teenager, and had done a pre teaching course during my time at sixth form. My mum, numerous aunts and my grandma were all teachers, and as such I had grown up around a shed load. They had left me with a very real view of what life as a teacher would be like. (In a nutshell – extremely hard work but immensely rewarding). When I was in the upper sixth I was looking at what to do next, I had thought about teaching then, but I didn’t think I was ready to embark on the journey just yet. I didn’t really think I was mature enough to go to university at that age, but my mum disagreed. I thought a gap year would give me chance to get the drinking and partying out of the way and let me go to uni as a more mature person ready to knuckle down. My mum thought a gap year would lead to me becoming comfortable in a minimum wage job and never getting round to going to uni. She won the discussion, and so I applied. I applied to maths courses, as I love the subject and still didn’t think teaching was right then. I think it’s a good job I didn’t apply to teaching as my first degree years were great, but my attendance levels weren’t. I was able to make up missed work with marathon revision sessions based on photocopied notes from my course mates (to whom I will always owe a debt of gratitude, and, let’s be honest, my degree!). I am certain that if I had been this lax on a teacher training course I would have been jettisoned sharpish, and quite rightly so. When I left uni I started the process of applying for the PGCE, but cancelled my application as, on reflection, I decided that I was not yet mature enough to put the hours I needed into it to get to where I wanted to be. Instead, I took a fulltime job working in the bar I had worked at during holiday periods from uni. This was a great job that I enjoyed, but it was only ever a stop gap. I did move into relief management for a time, and I guess the hours I put in then (90 plus) put the 50 plus I put in now into context. I returned to uni after a year and completed a postgraduate diploma in finance. My attitude was better and I feel I got a lot out of the course, but most significantly, it reminded me that I wanted to be in a profession that was making a difference, not in the world of finance where everybody was out for themselves. I then worked in a variety of project and admin roles within local government based around children and young people. This took me into the sector I wanted to be in and I enjoyed the years I spent doing them, but I was not at the frontline. I attended a multiagency training session with many people who were on the frontline and it hit home how much I wanted to be there. I promptly applied for my PGCE and here I am now. Doing a job I love, and one I can’t ever imagine giving up to head back to the mundane life of the office. I am passionate about the subject, and I am passionate about the profession. These are the attributes we need to be looking for when recruiting new members into teaching. There was a man on my course who left a well-paid solicitors job to train as he had that same desire. There was a guy called Johnny Saunders who used to report on the sports for the Beeb (including the Chris Evans breakfast show), left his high profile journalism job to train to teach because he has that passion. These are the people we want. Not the people who finished uni, didn’t know what else to do so applied to teacher training as it gave them more time as a student but with their fees paid for. Not the people who were made redundant during the recession, struggled to find another job so sought out the biggest bursaries. But the people who want to teach, who want to make a difference to the lives of young people and who want to share the passion they have for their subject with the next generation. Today I have taught two lessons on Ratio, both were very different, but both went well. The first lesson was to a very able year 7 class. It was a long lesson (75 minutes) and we got a lot done. At the start of the lesson not everyone knew what a ratio was, but by the end they could all write ratios, work out ratios from pictures, split amounts into two part ratios and the majority of the class could split them into three part ratios. The lesson is P2 and comes after assembly. Our academy is split into 3 schools “Foundation School”, “Middle School” and “High School”, this doesn’t mean that they are in separate buildings or anything, but it means each school is over seen by a teaching Head of School who co-ordinates everything, with each year group having a non-teaching year manager who focuses mainly on behaviour. Our assemblies are run in school groupings, and due to a raising intake of pupils, the foundation school assembly has had to be split to accommodate the whole group in the hall. This means that P2 on a Monday my Yr7 class tend to arrive in two blocks, the first half come on time, they have been in the first assembly and as such have been let out of their tutor bases at the correct time, the second group invariably arrive a few minutes late and in dribs and drabs as assembly finishes and the whole hall filters out. This can lead to a messy start to lessons, so i like to have a bell activity. Today’s was a word search based around ratio and pupils were asked to work out meanings for the words too. This was a good settler and helped them learn meanings and spellings of key tasks. As the lesson went on we had a short task on simplifying fractions, a MWB activity on writing and simplifying ratio, a card sort activity on writing and simplifying ratio, an extension sheet here asking pupils to set things out in ratios, a discussion around splitting amounts into ratios, a task on writing instructions for this, a task involving questions on the board where they split amounts into ratios and a further extension task involving some past paper GCSE questions. The chunking of this lesson helps with the pace and to keep the pupils on task. They were all engaged with each task, and made great progress. As a plenary we reviewed the objectives and pupils graded their own learning, and I asked them to write some questions based on today’s lesson which we will use in the starter activity tomorrow. I did leave the class wondering if i had spent a little too long on the earlier tasks. I had two people in observing the lesson, not an official observation. One was a PGCE student who is due to take on the class next week, and a colleague of mine from the PE department with whom I am doing a project based on observing each other so we can gain ideas on teaching and a better grasp on the lesson grading process. 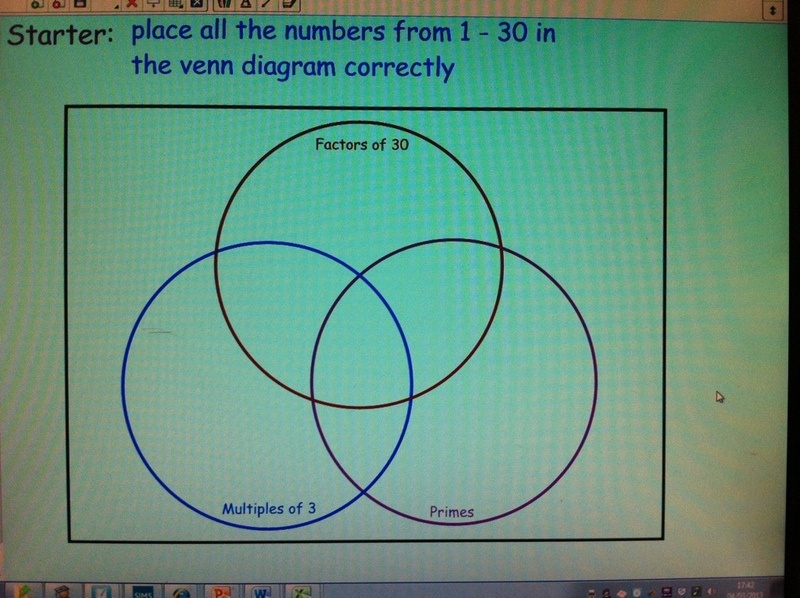 (Read more here: https://cavmaths.wordpress.com/2013/02/01/observing-others/ ) My PE colleague said he could tell the lesson went well as the time flew, I think this is the key to the longer lessons, and I think in this lesson it was achieved by the amount and variety of tasks. The second lesson I taught today on ratio was to a low ability year 8 class. They are starting at a lower level and the lesson was much shorter (50 mins), so I hadn’t planned nearly as much. At the start of the lesson they did not know what a ratio was, and by the end of the lesson they could write multiple part ratios and simplify them. They come from Tech, and all seem to be in different tech classes and arrive at different times. I find a bell activity works to settle this class too and so I used the word search, and as a class we discussed the meaning of the words. We then went on to a discussion of ratio and what it meant and a show me activity where the pupils had to tell be the ratios of red dots to green dots etc, this was a good task and it moved onto simplifying ratios as it went through, all pupils were engaged and they all quickly got the hang of it. 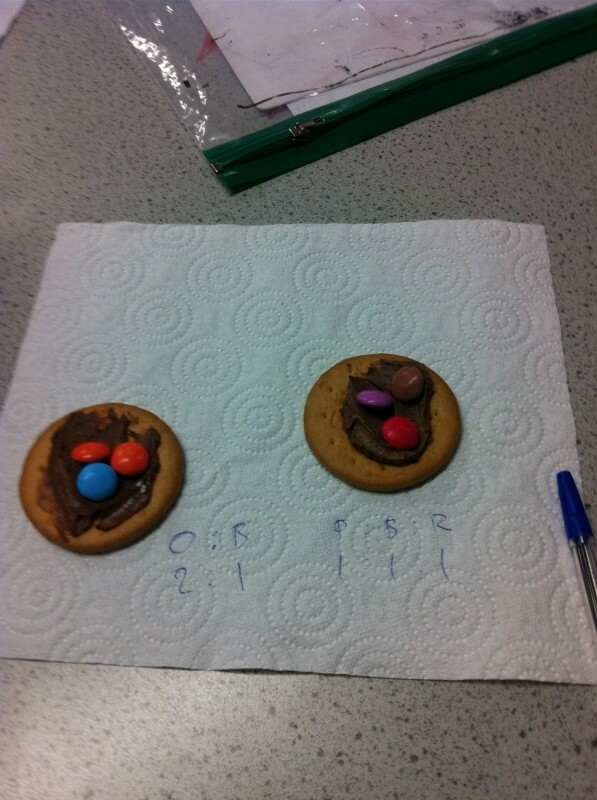 We then moved into drawing pictures of ratios and then onto ratio biscuits. 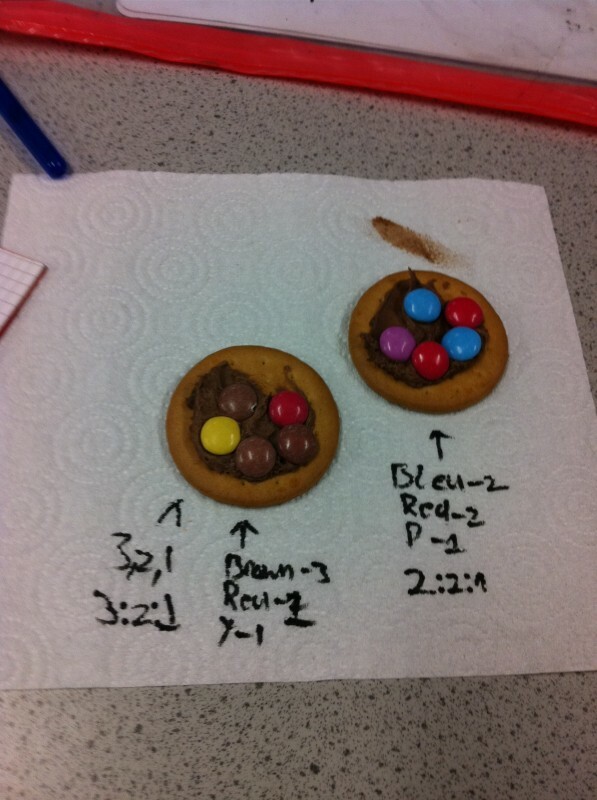 This was an idea I had got from Paul Collins blog and I have been itching to try it, but it seems to have taken forever for ratio to come up on the SOW (http://mrcollinsmaths.blogspot.co.uk/2012/09/icing-biscuits-all-in-order-to-teach.html). 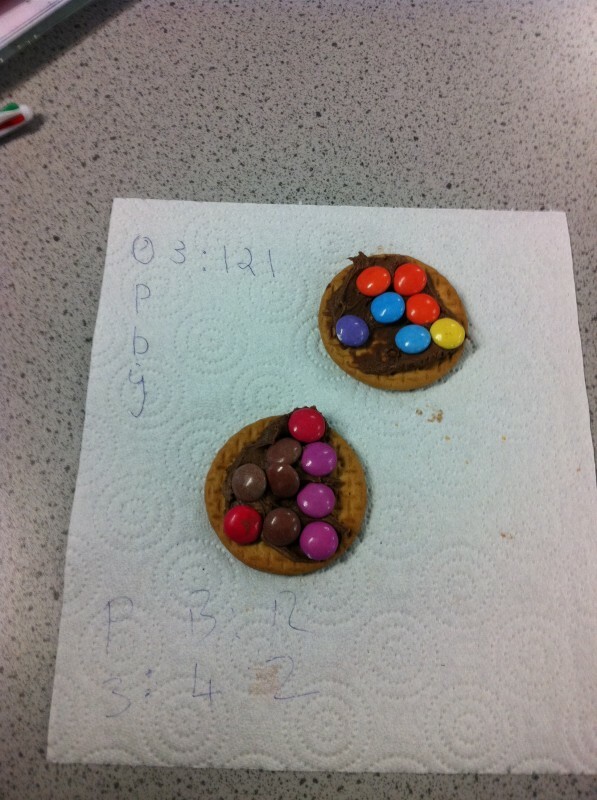 The class were given two biscuits each and some Smarties. 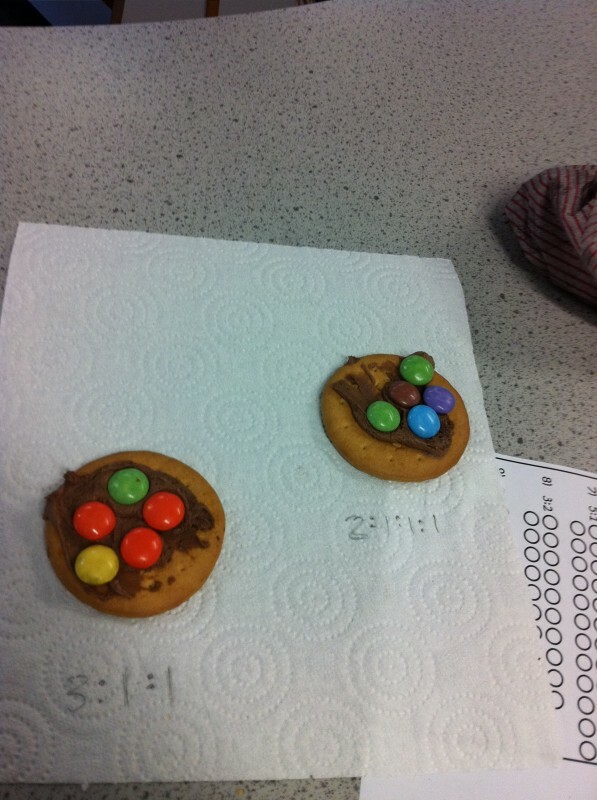 The TA in the class spread frosting on their biscuits and they decorated them with said Smarties, they then had to write the ratio of colours of Smarties out on the kitchen roll (in its simplest form). If they were right, they got to eat their decorated biscuits, if they were wrong; Miss and I were going to. Unfortunately for us, they were all right. It was easy to differentiate this task by selecting the colours of Smarties the pupils received! The plenary for this lesson was exit tickets and the pupils showed they had met the objectives and enjoyed the lesson. 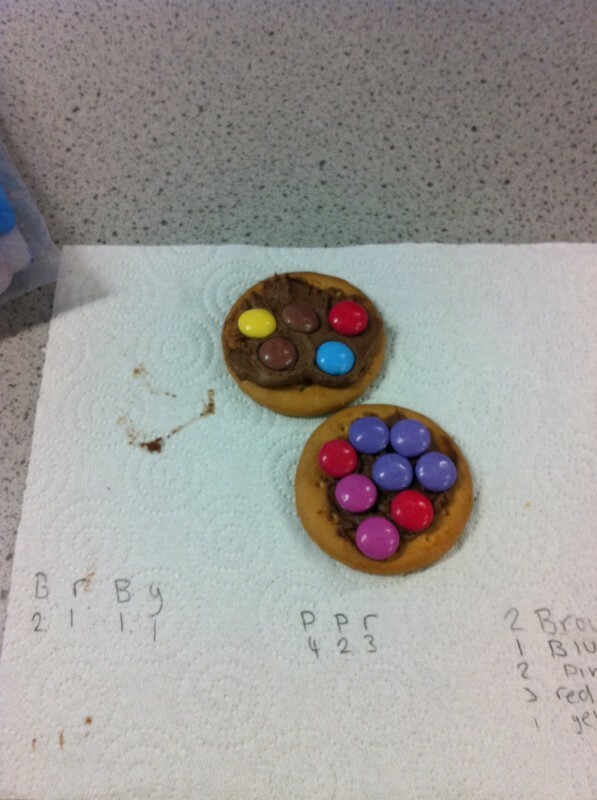 Here are some pics of the biscuits! Last week I was lucky enough to see two more of my colleagues deliver lessons, and from each one I learned a few things. The first I saw was an A-level physics lesson, this was delivered by an experienced colleague of mine who has a background in FE colleges and as such is very experienced in post 16 teaching. He welcomed me into a year 12 lesson on Hooke’s law, and I am pleased to report that I enjoyed it immensely, The lesson atmosphere was very similar to my own post sixteen lessons and his approach to the topic was similar to the one I would have taken if I as teaching it, so I could take away the knowledge that I’m not completely wrong! I was a little worried as to the length of time it took the pupils to draw and plot two graphs though. This made me think about my own teaching of graphs. From year seven upwards I normally give out graph paper with axes already drawn on to pupils when touching on graphs, as the drawing of axes can take a while and they are always given axes in the exam paper. I realise now this is a rather insular way to look at it. My question usually is: “when will they ever need to draw a set of axes?” this question hasn’t changed, but the answer has. Before, my answer would have been “never!”, but now I know the answer is “for A-Level physics”. They need this skill for their A-Level in physics and I would assume Biology and Chemistry also. It is something they need to do as part of their assessed practical, and it is a skill I can start to hone in my pupils way before they get there, meaning their A-Level science might be a tad easier. I am going to insist that the higher ability pupils I teach learn these skills early, so that in the future our A-Level science students are already equipped with them. There is, of course, the further question: “is it necessary for them to draw them by hand in the digital age we live in?”, but I feel that’s a question for another blog post on another day. The other lesson I saw was taught by an NQT within the department, we share a class and I went to see her teach the class we share. It was great to see the class in a different light, and to see how they respond to another teacher. There was also an IT failure at the start of the lesson, and I was amazed by the calmness the teacher had and the way she adapted her plans to go without it. I also gained a superb starter task out of it (see below)!